Peter Griffin of the animated sitcom Family Guy winces in pain. He probably doesn’t have compartment syndrome, but should probably look into the symptoms. Note: This article has been updated to include comments from U.S. 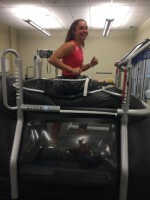 Ski Team development team skier Julia Kern, who had compartment-syndrome surgery last spring. Shin pain is an increasingly common complaint among cross-country skiers, causing many lost days of skiing every year. It’s difficult to identify a single reason for the trend, but greater training demands, such as high volumes of rollerskiing in the offseason, increased boot stiffness, diets that don’t meet the caloric demands of training, or single-sport specialization from a young age may play a part. In the individual skier, however, a sports medicine doctor can make a specific diagnosis, find the cause of the problem, and then tailor a treatment plan for the athlete. The three most common causes of shin pain are shin splints, bony stress injuries and exertional compartment syndrome. The term ‘shin splints’ is often incorrectly used to describe any shin pain in athletes. However, true shin splints are caused by micro-tearing of the muscle away from the bone along the medial, or inner, part of the lower shin. Pain from shin splints is often spread out along the inner shin, and typically goes away or ‘warms up’ with exercise, but comes back after exercise or after a hard workout. In more advanced cases, the pain can worsen during exercise, limiting a skier’s ability to race and train. Most athletes with shin splints are sore for the first few minutes of a ski, then the pain improves or disappears entirely, and then they are sore again after they cool down. Shin splints are often diagnosed without any special testing, and can be managed effectively with relative rest, stretching tight muscles, especially those of the calf, strengthening weak muscles, especially those of the hips and ankles, and working on ski technique and balance. A physical therapist and sports medicine physician can work with the skier to identify underlying biomechanical issues that could be causing their shin splints. An arch support orthotic may also be helpful. A bony stress injury is a more serious condition, which occurs across a spectrum. Milder injuries cause some inflammation in the bone; more serious injuries can lead to a fracture, or break, of the bone. I often use the analogy of a paperclip to illustrate how these injuries happen. Bend the wire of a paperclip back and forth enough times and the metal will start to get warm. That heat is analogous to a mild bony stress injury. Keep bending the paperclip, and it will eventually break, much like with a stress fracture. Bony stress injuries occur in athletes who engage in high volumes of exercise without allowing adequate rest time for the bone to heal between workouts. A skier may be more at risk for this type of injury if his or her diet doesn’t provide adequate energy or nutrition to allow the bone to heal properly. Bony stress injuries can occur anywhere in the lower leg, including both the large shin bone, or tibia, and the smaller shin bone, or fibula. The location of pain is often much more focal than in shin splints, with the athlete being able to point, with one finger, to where the pain is most intense. Pain often worsens with activity, causing an athlete to abandon workouts or races earlier and earlier as the injury progresses. Because symptoms can overlap with those of shin splints, an MRI is often used to distinguish between the two. Treatment for a bony stress injury requires rest for the bone. If the bone has fractured in a high-risk area, however, surgery may be necessary. Training through worsening shin pain may lead to a more serious stress fracture with a much longer lay-off from skiing, or even a season-ending surgery. It’s important to get a diagnosis and full work-up quickly. If caught early, these injuries can be managed effectively and prevented from worsening. Exertional compartment syndrome is a less frequent cause of shin pain in nordic skiers and can be difficult to diagnose. Compartment syndrome occurs when the muscles expand during exercise, due to increased blood flow, but the sheath around the muscle does not stretch adequately, which causes the pressure in the muscle compartment to increase. The four muscle compartments in the lower leg: one in the front, one on the outside, and two towards the back. There are four such compartments in the lower leg: one in the front, one on the outside, and two towards the back of the lower leg (at right). 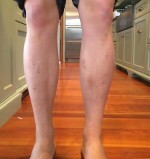 Athletes with this condition complain of crampy pain in the shin or calf that starts a few minutes into exercise, continues to worsen, and then quickly improves after they stop exercising. This pain is caused by the muscle becoming strangulated as the high pressure in the compartment prevents muscle tissue from getting enough blood to continue to work at a high level. Depending on which compartment or compartments are affected, and if those compartments contain nerves, athletes can also feel tingling or numbness associated with the pain. They may even experience a sensation that the foot or ankle are weak, causing the skier to more often catch their tips in the snow. A sports medicine physician may order an X-ray or MRI to rule out other causes of pain, and may also suggest a special test to measure the pressure in the compartments before and after exercise. Compartment pressure testing can be uncomfortable, however, and a diagnosis of compartment syndrome can often be reached without it. Most compartment syndrome can be treated non-surgically with the proper physical therapy and technique adjustments, but in some cases, surgically opening the compartments of the lower leg can be helpful by opening the muscle sheath and allowing the muscle to expand fully during exercise. Shin splints, bony stress injuries and exertional compartment syndrome have similar symptoms, but they require very different management strategies. Skiers who experience shin pain that worsens with exercise or lasts more than two weeks, despite rest, should immediately consult a sports medicine physician who is familiar with the demands of nordic skiing. Addressing the injury early may prevent a much worse injury, and even allow the athlete to continue skiing at a high level while addressing some correctable technique, strength, or flexibility issues throughout the remainder of the season. – I think if I had done more calf stretching early on, it could have been a lot better. Also, I assumed that my numb toes were coming from my boots and never had second guessed that it was something else like compartment syndrome. I think technique is also a big factor. I think I may have been able to prevent by altering my technique in skating. With that all being said, part of it can be genetic so I cannot say home much was in and out of my control. In hindsight things are much more obvious and clear. – Through this process I have learned how important it is to listen to my body. For cross country skiers it is often times easy to push pain under the rug because you think it is no big deal and it will go away. From my experience, sometimes this is true, but most of the time the pain or injury escalates and you loose a lot more time from training when you don’t address the issues early. Keeping a very detailed training log is important because it is easier to recognize an injury coming on. – My recovery has been filled with ups and downs, but now I am fully recovered. I took the more cautious, slower recovery because the reoccurrence rate is a lot lower. 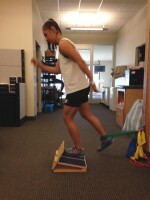 I was lucky enough to have spent 6 weeks rehabbing in Park City, at the COE with access to PTs and other resources. About the Author: Krys Bigosinski, MD., is a sports medicine physician in Portland, Maine. He helps provide medical coverage for the US Cross Country Ski Team and is an avid nordic skier. He is also the Associate Program Director for the Maine Medical Center Sports Medicine Fellowship.